I wanted a warm up so rode from home to the start line, this wasn’t too far, just short of 10 miles. I took it easy and got there in plenty of time to register and meet up with the others. We set off around 09:30 and almost immediately started to steadily increase the pace to a pace that would easily see us finish within the target time. We headed out through Chipping Sodbury, took some back roads out through Codrington, there was a relatively short steep incline up towards the A46, we crossed over the A46 staying on country roads. By this time we had picked up a few other riders that had tagged along for an easy ride, little did they know that at that time we were just taking it easy, we increased speed a little more and started to happily ride along at around the 25mph mark, this did see a few drop off the back, but was comfortable for the 5 or us. However Brad, yes Brad decided that we would bridge a small gap to a group of riders just ahead of us, he went alone for a while until Matt and Andy also decided to power on up the road and join the group. This did leave Pete and myself hanging out the back trying to get on too, we didn’t make it, the larger group was too strong for us and we couldn’t bridge the gap. Eventually they disappeared off into the distance. I had a small problem with a wasp sting on the arm, I spent a couple of minutes riding and tending to the sting, however during this I dropped off the wheel of Pete and never caught back up with him, so from around the 17 mile mark Brad, Matt and Andy were in a large group powering forward, Pete and I were riding alone on the road battling the wind alone, there was no chance that we were going to see each other until the end. The wind was strong on our own, but still on target to complete within the target time of 2 hours of less. When I was approaching the finish line I was a little concerned that I was not going to make the target time, although I was a little closer than I thought. I eventually finished with a GPS recorded time of 1:56:01 so only just withing the target. The others had already found the free food and were about to sit and eat. I grabbed myself some food and joined then for a post ride chat. Pete and I did give Brad some grief for ditching us out on the road, but I’d have probably done the same if I was feeling fast on the day. I could write about my excuses, being tired from the long day the previous day, the McDonalds meal from the evening before and all the other juke I ate wilt at Alton Towers, but I not going to (or did I just do that?? I’ll post official time here later. As this was not a race there are no official positions, I’ve added these. Next event is starting Sunday 24th August at 12:00 and finishing 00:00 same day. As I no longer do my own blog, I thought that I should probably start doing the blog here again, so from now on I’ll be posting short updates of what the Bedminster Riders are doing. Weather forecast is looking good for the event so the target time would be possible. Once we’ve completed the route I’ll post our official times here. Hi all, I know it’s been a while since I last posted here, but since then I’ve done a few races and a number of training rides. One ride was a Strava Challenge to ride at least 79 miles in one ride, I actually rode just over that, which will have been my longest ride now for a number of years. I’ve also done a couple of other Gorrick races, Autumn Classic 2 and Brass Monkeys round 1. With the above completed a while ago and Brass monkeys round 2 only completed yesterday this post will be about the most recent race. most of the team arrived at the venue around 08:30 and with my race starting at 10:00am, Harry’s at 10:10. Pete’s, Brad’s and Matt’s race starting at 12noon we had plenty of time to prepare bikes, fix punctures, oil chains, adjust breaks, fuel bodies. Race time came about quite quickly for me, this year the event organisers have introduced a small start loop to break the riders up a little to reduce the bottle necks. I got a good start and found myself up near the front pack so missed any stall due to bottle necks, I didn’t stay up with the leaders for long though, they are in a completely different class of riding then me. First lap went well, mile marker 3 and 4 came and went quite quickly, with some nice descents and some single tracks. The second part of the course was a little harder, not because of the hills, but mainly due to the sticky mud that was causing havoc with my summer racing tyres. I was struggling to get traction so found myself walking up some of the hills. time to change to winter tyres I think. I did see Brad and Pete around the course taking pictures and filling time before they start at 12. They were doing the 2 hour race, they aren’t a stupid as me. I like to push myself until it hurts and I can’t ride anymore. Harry’s race started at 10:10 just 10 mins after I started, and although he’s much slower than I am I usually catch him up at the end of my second lap. However this time I didn’t, not sure if that’s because he’s getting quicker, or if all the walking I had to do slowed me, but none the less I was a little surprised that I didn’t catch him. By the time I had finished my second lap, Brad, Pete and Matt would have been riding for around 20 mins, so there was no chance I was going to be able to catch them, I was also beginning to feel a little sluggish and my legs were beginning to burn. 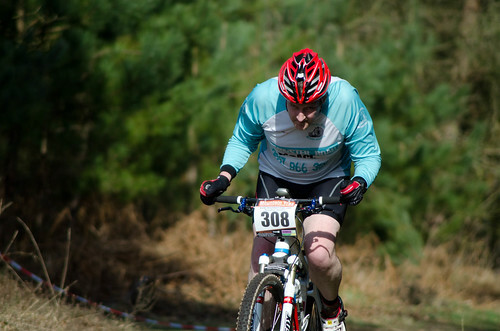 Half way around my 3rd lap I did suffer with cramp, which stopped me for a few minutes whilst I stretched it out. There were now riders stopping all over the place all suffering with cramps, most only 3 laps in. At this stage I still had it in mind that if I passed the start/finish line with time Left on the clock I would push on and do another lap. That wasn’t to be the case though, I cramped up several more time around the second half of the 3rd lap, an when I passed the start/finish line by legs, head and every other part of my body said stop. I was also surprised to see all the others at the line, all changed cleaned up and cheering me on, odd, had they started, had they finished??? Turns out they had finished, each completing 1 lap, Brad had crashed out, Pete was suffering with breathing problems (he was suffering on the way with a bad cough), and not really sure why Matt stopped, needless to say their positions were great. Its unusual for me to be racing on a Saturday so the whole weekend felt a little weird, I kept thinking that I would have to go to work the next day. This time the race was local so I also didn’t need to be up darling the morning like most race days. The start was a late start too, so i actually gotta have a little lay in, and no rush to get out the door. All my kit was still ready the Night before so all I had to do was load the car. The rest of the family were joining me too, the sun was shining and it felt warm. We got to Ashton Court in plenty of time to get ready and meet together team members. The venue was already chewed up a little from the morning races, the car park however was one big mud bath, glad I have 4×4 that could cope with it, there were plenty of other vehicles that couldn’t. I was a little too relaxed, all of a sudden the race start time was upon us. I got to the start line with about 2 minutes to spare, the start style is a lemans stat, and anyone that knows me, I don’t run, not at all, never, so I didn’t really like the start, luckily I didn’t have to run far, I had put my bike as close to me as possible. Read soon on the bike and pedalling, not fast of too hard, I knew that I had four hours ahead of me. However I soon passed Pete, who was already suffering from a bad knee,then Brad, not too sure what was wrong with him! Matt was off quite quick, but I wasn’t concerned as I knew that i would start to pick people off on the second lap, once I had warmed up. The first lap is actually a half lap, this too me 22 minutes, which wasn’t bad. The track was slippery and I had far too much ait in my tyres for the conditions, I was all over the place an had no confidence in the bike, I stopped quickly an let a bit of air out of the front wheel. There was an immediate change to the handling of the bike, I had a little more trust that the front wheel was going to stay where I wanted it too.I could now see Matt in my sights an soon caught him. We rode together for 3/4 of a lap, when we reached the Stella climb I said my goodbye and went ahead. This didn’t last long though as I was having problems keeping my chain on, it’s normally OK, but guessing there must have been a problem with mud, I can also usually get the chain ring to pick the chain back up, but on this occasion I had to stop and put it back on the ring this stop Matt passed me again. This was the last I was going to see him again while racing today. As I passed the start/finish line he ha pulled off the track an finished his race for the day. I continued on to do another lap, this lap was a bit wet as the heavens decided to open. This was my last lap, as I passed the start/finish line I thought that I ha around 1/2 hour of racing left, but it turns out I was wrong, there was 45 mins. Although the clocks stops at 4 hours, and the lap your on won’t count if you’ve not passed the line before the 4hours is up, I was consistently doing 41 min laps, apart from the lap I had a puncture, which was 51mins, so could have got another lap in. I was happy with the results though. 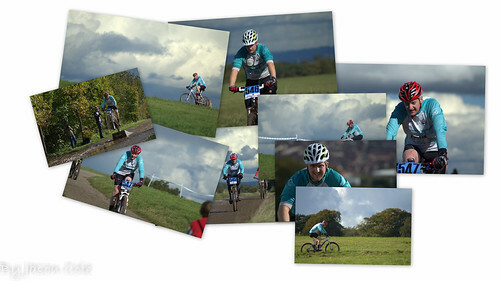 This years Bristol Bikefest was held in Ashton Court as per normal, it follows the groomed trails for the most part and covers a little over 5 miles per lap. The weather in the week running up to the weekend festival was appalling, torrential rain & gales. However I think that we were very lucky. 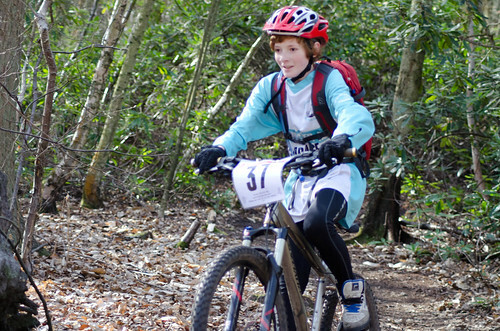 Although I wasn’t there on Saturday the weather was nice and dry for the 12 hour & the kids race. Harry was competing in the kids race this year, he was taken to the race by the team manager (Brad) who cheered him on. Harry did really well, coming in first. This is now his second race win, so I’m pleased for him. He was awarded a certificate and a medal for his efforts. Sunday was race day for the Bedminster Riders team, most of the team were doing the 3 hours solo, however I had opted to do the 6 hours solo. Mainly in training for the Isle of Man End2End race later in the year, however due to the appalling weather earlier in the week this race was cut from 6 to 4 hours, so it wasn’t going to be the test I was looking for. Nevertheless I was still going to enjoy myself and just take it at a steady pace for the 4 hours. As per normal for this race it was a Le mans style start, which I hate as it involves running… I was one of the last to get to my bike from the whole field, certainly last in the team, so I had more work to do than most. I quickly passed the other in the team, apart from Mike, our latest member of the team. The first couple of laps I was passing people, picking them off one by one until I found a natural place in the field of riders. Then all of a sudden Brad was up behind me, not quite sure where he managed to catch me up but he did and passed me. I wasn’t going to let that bother me though as I knew I had another hour or racing on him to do and wasn’t going to let my competitive nature grab hold of me. I just continued on at my own steady pace. I was actually enjoying the climbs and had been learning to climb better recently. Resisting temptation to spin a really easy gear has certainly helped me climb better, not only is staying in the right gear quicker but it also offers better traction over the slippery rocks. Not sure if I could have stayed sat on the bike for the original 6 hours around such a short course as boredom was starting to set in on just the 4th lap. So as I came across the start finish line on the 5th lap I was a little pleased that I only had 27 mins left on the clock. As the rules for this race are that you need to have finished your last lap before the clock stopped, I had no chance of doing another lap in just 27 mins, my race was done, although the official times are slightly different. I could possibly have pushed another lap in if the clocks were aligned and I knew I have 33 mins left. Another fantastic race by the Gorrick / Saddle Skedaddle people. As per normal it was an early start so that Harry could get there in time to start his race at 09:00. We arrived in plenty of time for him to ready and for me to check the bike over a little. Brad had put the bike together the day before so it needed a once over to be sure. Harry lined up for his race, again a little outclassed by the other riders, but luckily Harry is not bothered about that, which is great, I’d hate for him to be discouraged by not being able to compete for a good position, he simply enjoys riding. He did complete his 2 laps again, although I don’t know what his second lap time is at the moment, although I do know that the first lap was 58 minutes. 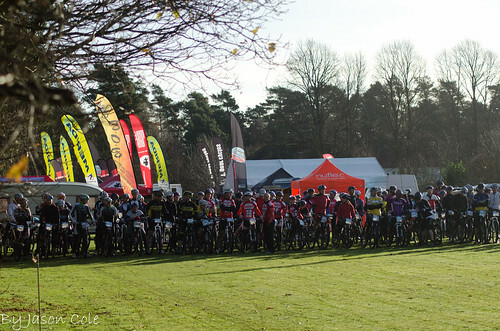 There were more Bedminster Riders at this race than normal, there was Brad (the boss) Pete, Richie and myself. Now I was under strict instructions not to race too hard as I am still waiting to see what damage has been done to my wrist from a previous MTB race crash. The MRI scan was only last Thursday and it’s going to take around a week to get the results. I probably should be on a bike at all, but hey ho! 12:15 and the Fun category had been selected by the title sponsor, Saddle Skedaddle to be in the draw for a free cycling holiday courtesy of Saddle Skedaddle of course, we didn’t win, but well done to rider 813 for winning this prize. We were soon off, Pete shot off closely followed by me then Brad and bringing up the rear Richie (in order of team position). It was quite a good start and I started to chase down Pete with Brad close on my heels, then I remembered that I should be taking it easy so eased up and let brad catch me. I rode around most of the first lap following him, until we got to a little incline where we could see Pete a little way ahead. Brad found this a very useful sight which spurred him on to try and catch him, so I let him go too. I did think that it would be funny to sit on Brads wheel for the whole race and then sprint at the end to beat him, but that would have just been mean. I continued on to complete the rest of the lap and the next, completing both in 1:01 (my timing) with Brad at 58 min and Pete around 1 min ahead of him. I’m not too sure on Richies time but will come back here and post all the official timings as soon as they are up on the web site. I really enjoyed this course, quite possibly the best course to date. 100% rideable an excellent mix of single track, ascending and descending. Some of the single tract through the trees was fast and twisty. More like this please. As usual today started early with a 5:30 alarm call so that Harry and I could be at Brads for around 6:15 – 6:30. We get everything ready the evening beforehand, so all we have to do is have breakfast, load the car and go. We arrived at Brads house as planned transferred all the kit to his van and set off to Crowthorne nr. Reading. We made it there with plenty of time to spare, Harry got ready while I sorted out Brads spare bike for Harry to use. We though we’d try him on a different bike this week, one that is lighter than my full sus. Soon time was upon us and we had to head down to the start line, Harry lined up ready for the off while Brad and I walked along the start straight so I could get a few pics and cheers Harry along. 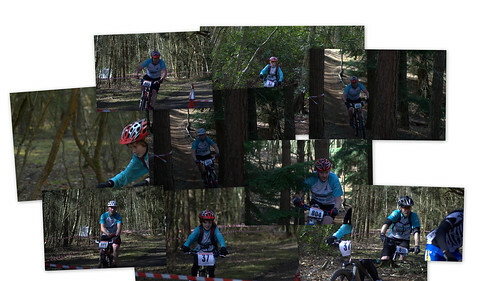 The course was good for spectators with plenty of crossing points and photo opportunities. 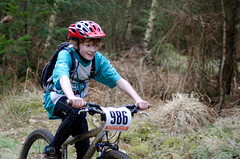 Harry was outclassed by other riders in his category but eventually finished 8th from 9 riders. The lead rider doing both laps in under 1 hour and Harry taking around 2 hours to do both of his laps. The main thing was that he was having fun throughout his race and that he did complete both laps. Soon it was time for Brad and I to take our posistions on the start line for the fun category. We got there early so we could make a good start at the front of the pack. We were doing the exact same route as Harry had already plus we’d already ridden a little bit of the start and the end. The race starts on a slight incline so we needed to get our gears right then quickly up through the gears to get some good speed before heading back down the other side. After the start straight there’s a sharp left and a couple of little climbs before heading into the single tracks through the woods. The course was great, the usual style course that we’ve come to expect from the Gorrick trail builders, a good mix of climbs, single track, technical sections such as the corkscrews and of course some downhills. For the first lap I tried to get as much distance between myself and Brad, who was trailing behind me. My tactick was to get the distance between us on the first lap so I could take it easy on the second lap givign my wrist a rest and not doing it any more damage. This was working until we reached the half way point on the second lap, I turned around and there he was about 100 meters behind me with another rider splitting us, he was closing fast. He also saw me at this point and started to dig deep picking the pace up as he imagined overtaking me for the first time. That wasn’t going to happen! I had to also pick the pace up, overcome the pain of riding with a broken wrist and just get on with it. I kept a keen eye on what was going on behind me, Brad soon passed the rider between us and was not about 50 meters behind, with around 1km to go. Luckily the last km was single track with a lot of corners so we lost sight of each other. All I knew was that he would be drawing ever closer, I was now into the last 500 meters, a short technical downhill, followed by a relativly steep climb, followed by the switchbacks around the start/finish line. I wasn’t quite flat out on the downhill as I was conscoius of my wrist so I freewheeled down the last part, rounded the corner for the climb and…Oh no, my chain had slipped off, No! No! No! I cried, I cranked the front mech over in the hope that the chain would be picked up by the teeth of the chainring. Luckily they did pick the chain up and I was off again, in the wrong gear but I had drive. As I reached the turn in the climb I looked back and Brad was 15 meters behind, running up the hill as fast as he could. I found the gear I wanted and pushed like crazy, ‘He’s not going to catch me’ was all I could think and with 100 meters left I took a quick glance behind me and knew I had it in the bag, I came through the the finish before him. Not sure of the time difference, but as soon as the official times are posted I add them to the bottom for here. GPS Route of the course. It was a set to be a really early start Sunday morning. My alarm was set for 5am so I hoping to get an early night, that wasn’t to be though. I had a call from Jennie asking me to collect her from work as she cut herself. The cut was pretty deep and she needed to go to A & E to get it looked at, we arrived at Frenchay hospital around 21:30 only to find that it was pretty busy and that the computers were down so everything was being done by hand. As it happened the wait wasn’t too bad and she was eventually seen about 11ish. A bit of glue, a few paper stitches and a bandage and she was done. We both still needed to eat so stopped off at Miss Millies then home to eat it. This got me into bed about midnight, so I wasn’t going to get much rest. Brad and my race was due to start at 12:15 so we had quite a long wait until we were due to start, we took this opportunity to ride a little bit of the course to get the lay of the land. We didn’t ride the whole course, although I think we should have. We did start a little late, about 10 mins. The weather was great, sun was shining and no sign of any rain, despite of this it was still cold standing around on the start line in shorts and short sleeves. I soon warmed up when we go going though, I made a good start, trying not to get held up too much by the bottle neck, I made it through in about 30th place leaving Brad somewhere behind me. I didn’t look back to see where he was, I was intent on now overtaking as many people as I could during this lap and then push for the last lap. I was making good progress, only having to dismount from the bike once, after losing traction on a steep gravely ascent. This quickly went into a narrow single track, where i got held up a little by a slower rider. I soon passed as soon as we got to a wider section then quickly into another short steep dirt ascent, this was full of people pushing their bikes, determined but to have to get off and push myself, I shouted the obligatory ‘RIDER’ and as courteous as ever space was made for me to pass. I had my next target in sight and quickly started to gain on the rider in front as we rode along some fantastic single track through the trees. He was passed quickly and I was feeling great so decided to push a little harder and see what I could do. This is where things went a little wrong for me. I was steaming down a tricky rocky, rooted section when all my effort was undone by a flight through the air closely followed by my bike tumbling down on top of me. I was ok, although a little annoyed by the first rider that passed me, he did ask if I was OK but I didn’t answer, as I didn’t really know what had happened only that I was on the floor with a bike on me. Normally fellow riders stop, but he didn’t and just carried on riding. About another 30 seconds passed before the next rider cam along, he did stop and asked if I was OK, by this time I had checked myself out, ankles, legs, hips, arms, shoulders, head, all was OK so I answered and suggested he carry on. I then set about checking the bike over, I had to straighted the handle bars, so they were in line again. The bar ends were a bit off line too but not crucial they were in line so I left them as they were, the same can be said for the front shifter. By this time Brad had caught me back up and I began to realise that I had probably done something to my wrist. I told him to carry on though and cycled behind one handed. Luckily there was a nice long flat straight so this was easy. I actually began to catch riders back up too, and even passed one rider, which was odd considering I was riding with 1 hand. This did go back into a short single track, but I had already decided that I was out the race and was looking for the way back to the start line and St John ambulance for someone to take a look at my wrist so was taking short cuts through the course. I found the ambulance and got myself sorted, check from head to toe and had my wrist strapped up and iced. They done a good tidy job of the strapping and said that it was torn ligaments but should get it checked out at A & E if problems persist. They took me back to the start line where I started to look for Harry and then wait for Brad to finish his second lap. 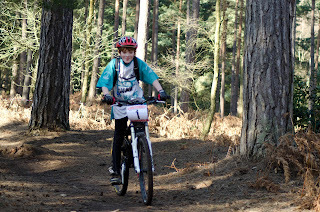 Brad had a great race and thoroughly enjoyed himself, eventually finishing 50th with a time of 1:21:22. Luckily Brad was the designated driver so I didn’t need to worry about the drive home with my injury. The whole team managed to ride together today, starting from the car park in Leigh Woods, rather than the usual Ashton Court start. We started off with a half loop of Leigh Woods, which was really busy. We couldn’t really get any speed up as there were a lot of inexperience on the tracks which just kept getting in the way, so we headed over to Ashton court for a quick blast around the trails there. Although the trails in Leigh Woods are more challenging Ashton court was actually better today as we could actually ride at our own pace. Well most of the way any way. Harry is improving with every ride which showed today. He’d not ridden Ashton Court for a while, but has ridden a few races, so when it cae to one of the steeper hills I said to the other that Harry should carry on and we’ll catch him up later as he can’t ride this hill. I was wrong, he found a comfortable gear and stuck it all the way up the hill. Brad, Pete, Richie and myself did catch him but Matt was still suffering with his bruising from an off a few weeks back. With one loop of Ashton Court complete we decided to stop for a nice warm bacon roll, then headed back into Leigh Woods for a quick loop of ‘Yer Tiz’ and head back to the van for a quick snap shot of the team as it’s not often we all get to ride together. That was the last round of a 3 race series. 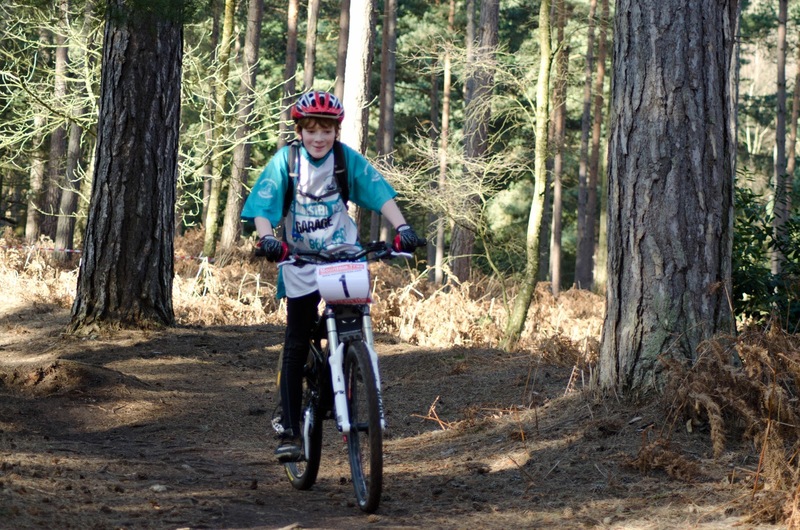 Brass Monkeys is the Winter series through the Gorrick Mountain Biking Events. I’ve always found the racing they organise very professional and aimed at the XC scene. they might be a couple of hours drive from home but always worth the effort. Round 3 was no exception, more climbing than the other 2 rounds but all ridable, the graident wasn’t leg bursting but did go on for quite a bit. Most of the ascending was on open fire road, with the odd single track. 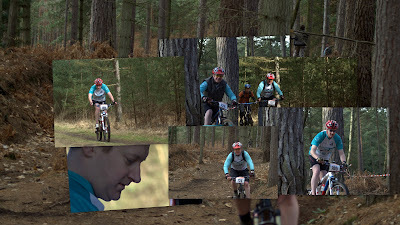 There were some fabulous flat single track through the woods, tight and twisty in places, just skimming the trees with my bar ends at times. The first lap saw a nervous approach to some of the steep downhills in places, hanging out the back of the bike just to keep from going over the bars, I also missed a great drop off into a steep downhill just near the end of the first lap. Second and 3rd lap was different though, I knew what was around the corners so attacked them with a hugh smile across my face. Maybe a little too much attacking on the 3rd lap washing out the front wheel and finding myself on the floor at one point. I don’t race these for the results, more of the personal challenge, and although I didn’t quite manage the 4 laps as planned I still enjoyed the race. The main ‘race’ comes from tryign to compete with the other in the same team. This time between Brad, Pete & Richie I came in first. GPS tracks and stats of my race is here.